To experience cheap RV living isn't about sacrifice, it is a by product of this frugal retirement living lifestyle. We did it for 6 years and highly recommend this way of life. 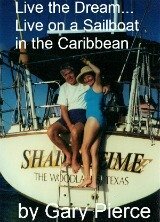 If the thought of sailboat living makes you sea sick...that's OK, RV living is a great way to retire. How cheap is cheap RV living? If you stay at a park on a monthly rate you should be able to find one for $300 to $500 a month. The same parks that charge $30 for a nights stay will cut that in half if you commit to a month...It is good for them and good for you. We stayed for 3 summers at the Thousand Trails park in Sunriver, Oregon, it was $450 per month flat rate. Not only were we in a great location surrounded by great recreation...I enjoyed the many places to fly fish for trout. We made lifelong friends, developed church ties...all possible when you stay longer than a few weeks. Remember if you stay put and with diesel at up to $4.00 a gallon (we got a whopping 7 MPG) it doesn't hurt so much. And there are plenty of folks who have a summer home like Oregon and just travel twice a year to say Palm Springs, another place where you can stay for $500 per month...not in all parks but some very nice ones with good security. We loved our winter home on wheels. So staying for a longer period of time is one of the best ways to experience cheap RV living. In Palm Springs for instance, the housing is out of sight even in a depressed market. You can enjoy the same super weather, make friends because you are surrounded by like minded people who like to remind themselves of how smart there are living in an RV. No lawns to cut, no huge AC bills, you get the picture. The RVer who goes from one park to another, staying no more than a week or so, is obviously going to spend more on fuel,repairs, tolls, all the costs of traveling that you will not incur if you can stay put for a few months or longer. So think about it, if you know where you want to spend most of your time take advantage of monthly rates being much lower than the daily rate and enjoy cheap RV living. 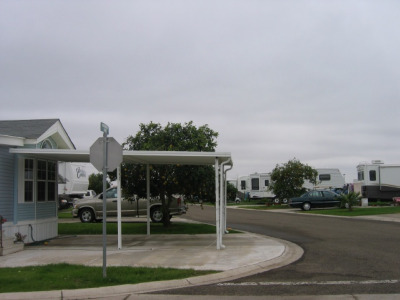 Here is a picture of a park showing a blend of park models with RVs. Longer stays make cheap RV living very doable. Your Social Security check or pension check goes further when you move around in the RV less and less. It's up to you but certainly will enable you to enjoy your dreams of retiring to living in an RV. As always compare this lifestyle to not retiring...I'm getting ill, time to stop...Enjoy!